An assessment of the quality of the calibrated data can be performed by selecting in the CLIC menu (Fig. ) the option Data quality assessment (see Fig. ). This procedure creates a clic procedure to flag data not satisfying predefined quality criteria. By default two different criteria are adopted to assess the data quality, depending if the project aim is detecting or mapping source emission. In the first case, the criterion is just the phase stability. In the second, data whose phase stability results in a seeing larger than the maximum defined in the widget are not considered. The adopted thresholds to assess the quality of the amplitude and phase calibrations change with the receiver band. The considered limits to evaluate the quality of pointing, focus and tracking are defined in relation with the primary beam and the wavelength. 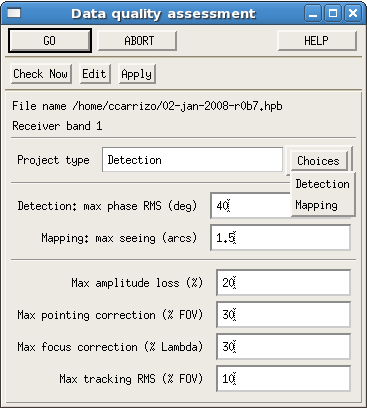 Plots are created to identify with shadowed areas the data of poor quality according to the limits defined in the widget (Fig. ). Histograms presenting a statistical analysis of the data quality are created at the end. By clicking on Check Now a clic procedure is created to flag the data shown in shadowed areas of the plots. It is to the user to Apply or not this procedure. The option Edit permits to modify the procedure before applying it.